Wood’s paintings–mostly–are striking. He makes landscapes, still lifes, interiors, portraits and various combinations of those genre. They have wall power. They are easy to like, with lots of color, conventional, pleasing images, I am posting several here. 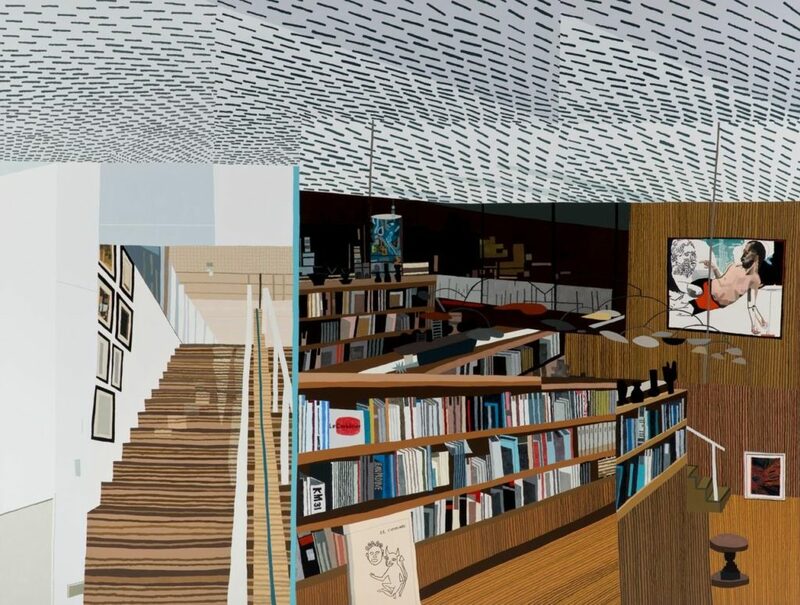 “He cites Alexander Calder as a major influence, and both “Ovitz’s Library” and “Clipping E2” (2013) incorporate Calder mobiles. 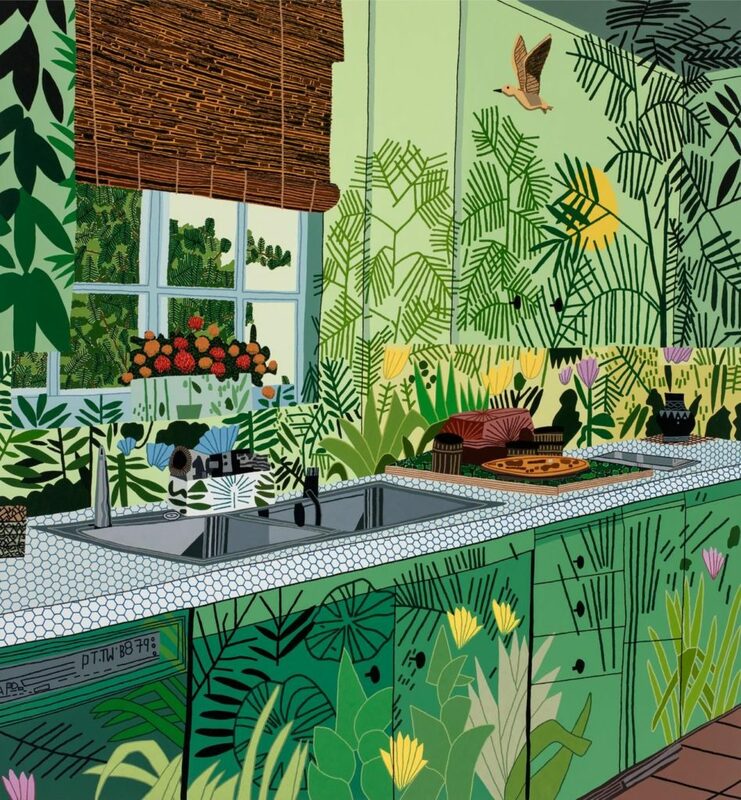 Other images, in pose or color or composition, refer to the work of David Hockney, Stuart Davis, Picasso, Rousseau and Vuillard, to name a few. 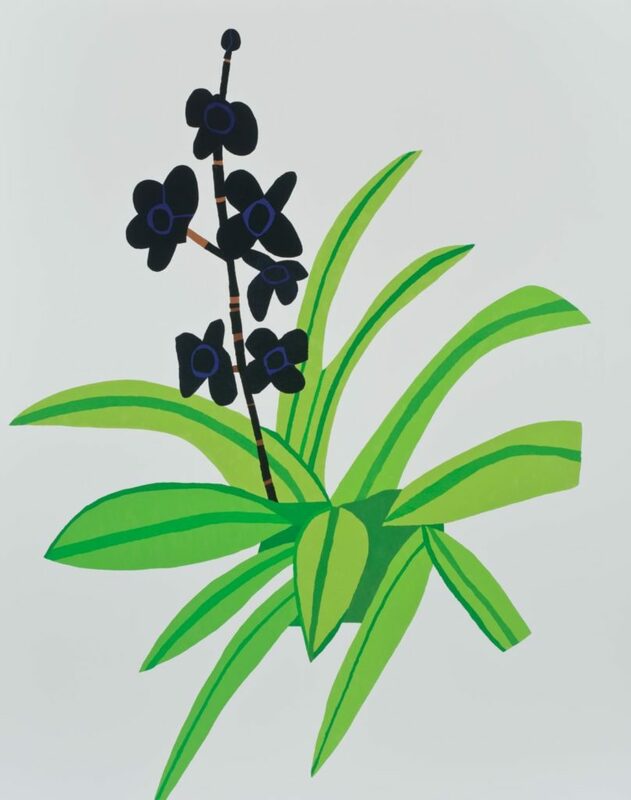 Patterns repeatedly run through his paintings, as they did Matisse’s, and Mr. Wood’s “Clippings” series recalls both Matisse cutouts and Ellsworth Kelly plant drawings. 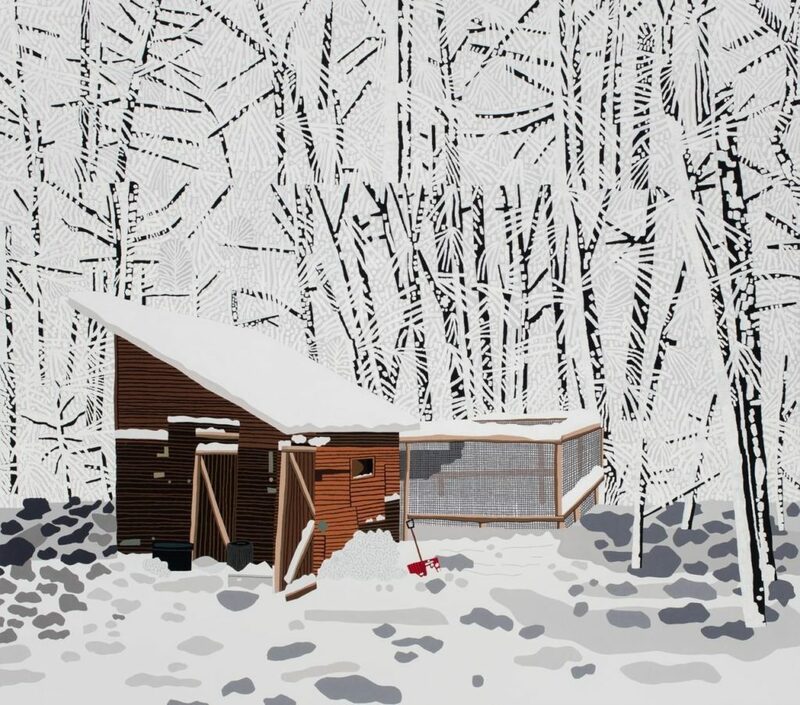 Like Jasper Johns, Mr. Wood uses hatchwork—for example, to create the snow-laden tree branches of his lovely “Snowscape With Barn” (2017). Just as troubling, why did Wood–of all the contemporary artists in the world–merit a museum exhibition after calling himself an artist for only a dozen years? The museums says its collectors (read “patrons” and perhaps “trustees”) own his works. So do many of the prominent, billionaire collectors who lent their works to the show–Eli Broad, Aby Rosen, the Marciano brothers, Michael Ovitz and more. It did not hurt that his major New York gallery, Gagosian, was also willing to be a “major” sponsor of the exhibition. Not coincidentally, Gagosian “is pleased to present new paintings and works on paper by Jonas Wood” at its Chelsea gallery opening Apr. 24. So, the “market” fix was in for Jonas Wood. But the whole thing makes me queasy. The museum is being used. I hear what you’re saying but I believe starting in the late 60s/early 70s young artists who were only around for 10 years or so started to get retrospectives. I believe Robert Morris is one example. Of course that period was also a time when American art proved itself to the market (Scull sale). I don’t doubt the taste or eyes or wisdom of messers Broad, Rosen et al, not to mention Gagosian. And I guess the exhibition is of a piece with the museum’s original, if not current, ongoing installation of the Wendy and Emery Reves Collection which, if I recall correctly, included her slippers, which created a bit of a tempest at the time, even if the tale of their inclusion in the exhibition was apocryphal. It may look like they’re holding an exhibition of an artist validated by the 0.01% because funding was relatively easy, but look at what else the museum is doing – “Berthe Morisot, Woman Impressionist,” “Women Artists in Europe from the Monarchy to Modernism,” “Modernity and the City” (European prints and drawings), and more. Queasy-making? Sure. But I can only imagine the difficulties trying to balance exhibition programming with all of today’s various and vocal stakeholders. .
Sure, but some perspective. “Women Artists in Europe from the Monarchy to Modernism” is a very small show, drawn entirely from the permanent collection with very few didactics (no catalogue, of course). It could not have taken much effort. “Berthe Morisot, Woman Impressionist” did not originate in Dallas–it came from the Barnes and the Orsay, and although Dallas added a few more paintings, again it did not take much curatorial effort. The slippers, are still there, undisturbed as dictated. To me, the Reeves installation is embarrassing. I find gallery and collector support of museum shows morally objectionable, but probably inevitable, given the big sums at stake in the contemporary art world. Gagosian was a major underwriter of the Whitney’s Jeff Koons retrospective five years ago. When Cindy Sherman got her overview at MoMA earlier, it was pointed out by Jed Perl and others that many board members of the museum own works by Sherman. I’m sure this goes on all the time, but shouldn’t there be a better separation of church and state? Thanks for your comment. I did not mean to suggest that this was a new phenomenon (in case others read the post that way). But I will point out a difference between the Koons and Sherman shows you cite and this one–like them or not, both Koons and Sherman had long careers, high market prices and other museum exhibitions before the shows mentioned. This was Wood’s first major solo museum show (he had a small Projects show at the Hammer a while back), and it could be crucial to establishing him as an artist to reckon with. Both Koons and Sherman already had that. Good point. I should have added that this will go a long way toward giving him the seal of approval in the marketplace. All the more reason why this kind of interface seems to me especially suspect.